A recent global survey of CEOs (1) highlights the unprecedented era of change that is reframing the relationships between customers and companies across the globe. Meeting the needs of increasingly demanding consumers, fuelled by digital disruption is now bringing the focus closer to a better understanding of human behaviour and customer decision making. Recognition too perhaps that technology is an agent for behaviour change and not an end in itself- making an organisations grasp of the understanding the influences around behaviour a core issue for its success. Personally speaking, it doesn’t take much degree of self analysis to realise that human behaviour is not as simple or as rational as we would like to believe. But it is interesting that this obvious personal truth is not so clear in a business context. All too often, plans (alongwith most economic forecasts) are still developed with underlying assumptions of ‘rational buyer’ behaviour laddering up to confident expectations of straight line growth. This is despite recognising that technology has transformed traditional thinking around linear customer journeys to purchase and acknowledgement that the consumer is now ‘in control’. The ‘rational man’ model was dismissed some time ago by academics as a poor explanation of actually how we make decisions. The evidence base from across the various fields of psychology and related disciplines, now championed by the behavioural sciences, offers a very different reality. We don’t have the mental space or time to weigh up the pros and cons of all the options we have for the multitude of decisions we face in our daily lives. We take mental shortcuts that bias our decisions, often occuring at the sub-conscious level which results in our actual behaviour straying some distance away from what might be forecast by standard economic theory. The networked society we are now in operates according to the rules of human rather than pure economic behaviour. Whilst we recognise that a fundamental shift in the drivers of consumer behaviour has occurred, typically that emotional affinity is a fey factor in our our decision-making along with the influence of our peer networks who have superceded conventional organisations as the key source of trust and authority, we don’t delve deeper to explain why this is the case.By ignoring the evidence offered from psychology we are failing to grasp the fundamentals around human behaviour which are vital in the dual challenge of improving customer experience and aligning the actual behaviours of employees around it. In the time poor world and short termism of our own business decision making we are neglecting to apply some first principles of human behaviour. In my experience, the need to think more deeply about behaviour and how to influence it is obvious when seeking to address some of the harder challenges facing society. For example, in the complex challenge to address obesity, a group of experts from across the disciplines developed the Obesity Systems Map, which using systems theory, mapped all the factors that contributed to the isssue (2). Over 100 casual factors were identified operating at the personal, social and environmental levels and this explanation was used to develop interventions across sectors including the development of the government’s own Change4Life programme. The map suggests that pressure across the whole system needs to be consistently applied by all sectors of society over time, suggesting that the current health focus on sugar intake will have limited impact unless it is part of a wider and prolonged integrated programme across the whole system. The emergence of the behavioural sciences is not restricted to government and policy makers with its adoption growing in the private sector too – across industry sectors and across functions. For example, Barclays have established a wealth management business based on behavioural finance (see https://www.investmentphilosophy.com/behavioural-finance/) and the technology companies such as Amazon are employing behavioural expertise. Examples of marketing more formally embracing the thinking are increasing but examples remain too few and often too superficial. Nonetheless, the diversity of adoption across the structures and disciplines of business points to the emergence of a lasting new tradition. But there is a more immediate priority to systematically connect applications across the siloes and provide a unifying route to meet the challenge of shifting customer behaviours that, according to the PWC survey, is currently preoccupying global CEO’s. This offers a real competitive opportunity for organisations who apply an understanding of behavioural change to the customer journey – aligning both the customer experience and the organisation around human behaviour. The outcome being an organisation that is tuned into the patterns of behaviour of both its’ customers and itself, and able to synchronise experiences through a shared picture of how behaviour works within fluid makets. It is not new news that the customer journey is no longer linear but how well are we adaptinging to this reality? Potential customers move at different stages and speeds through an iterative process of decision making, where associations are formed well ahead of entering a market and with active consideration supported by technology shaping new buying behaviour right up until the moment of purchase (E.g. the use of our smart phones before going in-store to check best local deals available). 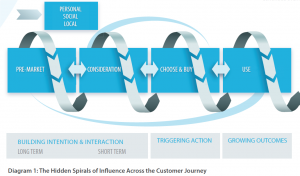 The subsequent customer experiences are often shared across personal networks to create positive or negative endorsements in what McKinsey have termed ‘the loyalty loop’ (4). But we are only partially sighted to the new dynamics at play and without a full picture of what is happening and why. In particular, we are missing the hidden patterns of conscious and un-conscious influence as people build intention, interaction and experience across the stages of decision making in the marketplace. There are numerous models that explain various types of behaviour. In general terms behaviour can be explained by factors working at four levels – namely personal, social and local/macro levels. Harnessing these insights across the stages of the customer journey (see Diagram 1 below) will ensure that customer experience ‘goes with the flow’ of human behaviour. And the picture is not complete until matched with an equivalent view of your own organisation’s behaviour and capability to deliver success at every touchpoint on this new customer journey. The effects we are looking to capture are multivariate and there is a significant role for behavioural analytics and ‘big data’ techniques here, but equally for a structured hypothesis and guiding framework on what is happening and what can be done to bring customers and organisations closer to create consistent value. These impact the individual and affect the choices and behaviours we undertake. Whilst these embrace values, attitudes and beliefs they focus on the factors that over-ride our rational selves. There are many biases that are well established such as ‘prospect theory’ established by Kahneman and Tversky (5), which demonstrates that ‘losses loom larger than gains’ whereby the fear of losing is at least twice as powerful as the pleasure of gaining with the result that people are more willing to take a risk to avoid making a loss rather than a gain. 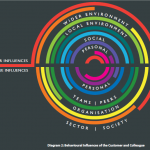 These factors exist beyond the individual and act in a social context to influence behaviour. ‘Network theory’ recognises that people are heavily influenced directly by what other people do and indirectly by our perceptions of what others would or should do. Hence the power of peer to peer networks in spreading ideas and influence and the explosion of social media. These also have a huge effect on why people do what they do. They can constrain and shape behaviour including the macro factors of market conditions and available technology, as well as the physical conditions in which people live and work. It also includes the more immediate situational context and moment of the decision. One of the key behavioural factor here is defaults, where we go with the flow of the preset options which then guide our unconscious habits and routines. Overcoming inertia is a key challenge for many markets with the financial and energy sectors obvious examples of where inertia presents the biggest barrier to change. Typically in our planning we overestimate the conscious individual factors and under-estimate the social and local impacts and thereby make decisions based upon incomplete explanations of behaviour. But leveraging these factors for customers and colleagues in the right combination and sequence will be key to their re-alignment. Recognising the key behaviours and factors at play across the customer journey is the start point to redefining the customer experience, which is very likely to then require process and behaviour change within the organisation to deliver the new service improvements. 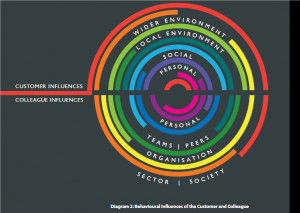 To enact that internal behaviour change, in a similar way to how you viewed the customer influences, you then have to consider what influences employee behaviour at a personal, peer, organisational level, to ensure a sustainable change through a common approach (see Diagram 2 below). So developing a unified view of customer and colleague behaviours across the customer journey offers a route to informing the internal change in behaviour required to ensure sustainable change and a better customer experience. A four-step approach makes this a practical reality which can be readily validated through a testing programme. Without the dual focus on customers and colleagues as a constant, the risk is that the intent for greater customer focus remains just that. But get the dual focus right, and the benefits can be profound. PwC Annual Global CEO Survey ‘A Marketplace without Boundaries? Responding to Disruption’ (pwc.com/ceosurvey). This article is extracted from the article published in the OE journal in January 2016. For the full journal see http://www.oecam.com/the-oe/getting-even-closer-to-the-customer/. 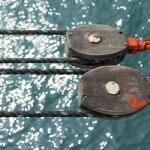 OeCam is a boutique firm of consultants who help maximise the effectiveness of individuals,teams and organisations.